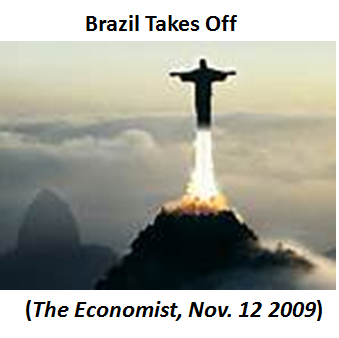 There´s no substitute for a clearly specified nominal target. To highlight its willingness to adjust the flow of purchases in light of incoming information, the Committee included language in the statement to be released following the meeting that said the Committee was prepared to increase or reduce the pace of its purchases to maintain appropriate policy accommodation as the outlook for the labor market or inflation changes. Going forward, the economic outcomes that the Committee sees as most likely involve continuing gains in labor markets, supported by moderate growth that picks up over the next several quarters as the near-term restraint from fiscal policy and other headwinds diminishes. We also see inflation moving back toward our 2 percent objective over time. If the incoming data are broadly consistent with this forecast, the Committee currently anticipates that it would be appropriate to moderate the monthly pace of purchases later this year. The Committee anticipated in June that, subject to certain conditions, it might be appropriate to begin to moderate the pace of purchases later this year, continuing to reduce the pace of purchases in measured steps through the first half of next year, and ending purchases around midyear 2014. However, we also made clear at that time that adjustments to the pace of purchases would depend importantly on the evolution of the economic outlook—in particular, on the receipt of evidence supporting the Committee’s expectation that gains in the labor market will be sustained and that inflation is moving back towards its 2 percent objective over time. At the meeting concluded earlier today, the sense of the Committee was that the broad contours of the medium-term economic outlook—including economic growth sufficient to support ongoing gains in the labor market, and inflation moving towards its objective—were close to the views it held in June. But in evaluating whether a modest reduction in the pace of asset purchases would be appropriate at this meeting, however, the Committee concluded that the economic data do not yet provide sufficient confirmation of its baseline outlook to warrant such a reduction. The chart indicates that the FOMC has been ratcheting down its growth expectations. It continued to do so in September. So there was really no other option but to ‘call off the taper’. What really must be ‘bugging’ the Fed, however, is the behavior of inflation. 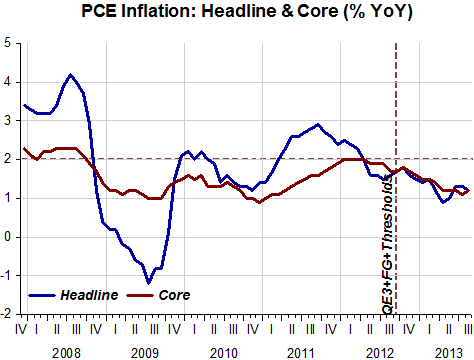 Although the Fed has for a long time been saying that “participants generally continued to expect that inflation would move closer to the 2 percent objective over the medium run”, the chart shows that even after QE3 + Thresholds + Forward Guidance both headline and core PCE have continued to trend down! 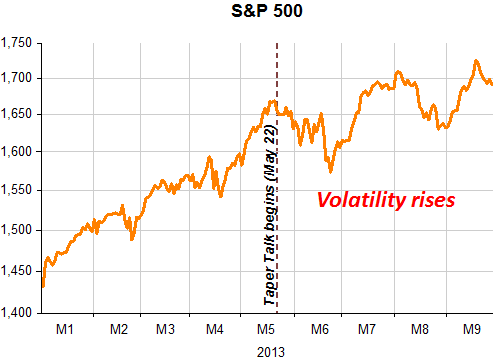 One effect of the ‘tapering talk’ has been an increase in asset market volatility. The chart shows the S&P index since January 2013. One thing to hope for is that a change in Fed leadership will also bring changes in its modus operandi! The secret of brilliant productivity will always be discovering new problems and intuiting new theorems, which open the way to new results and connections. Without the creation of new viewpoints, without positing new aims, mathematics would soon exhaust itself in the rigor of logical proofs and begin to stagnate, as it would run out of content. In a way, mathematics has been best served by those who distinguished themselves more by intuitions than by rigorous proofs. I’m not going to redraw the graph, but with today’s numbers (308,000 on the 4 week average) we have fallen below the 0.1% level, meaning that fewer than 1/1000ths of Americans now file for unemployment comp each week. That’s not just boom conditions, it’s peak of boom conditions. The only other times this occurred since 1969 (when unemployment was 3.5%) were just a few weeks at the peak of the 2000 tech boom and a few weeks at the peak of the 2006 housing boom. In other words, the puzzle is now even greater than 6 weeks ago, as the unemployment rate is still at recession levels (7.3%.) Something very weird is going on in the labor markets. I don’t have any good ideas. Perhaps employers are reluctant to add workers for some reason (Obamacare?) and instead work them overtime more. Then when demand falls instead of laying off workers, they cut overtime. But I don’t recall the average workweek numbers being all that unusual. My hunch is that these new numbers portend further declines in the unemployment rate in the months ahead. Which is also a puzzle given that RGDP growth is about 2% in recent years. 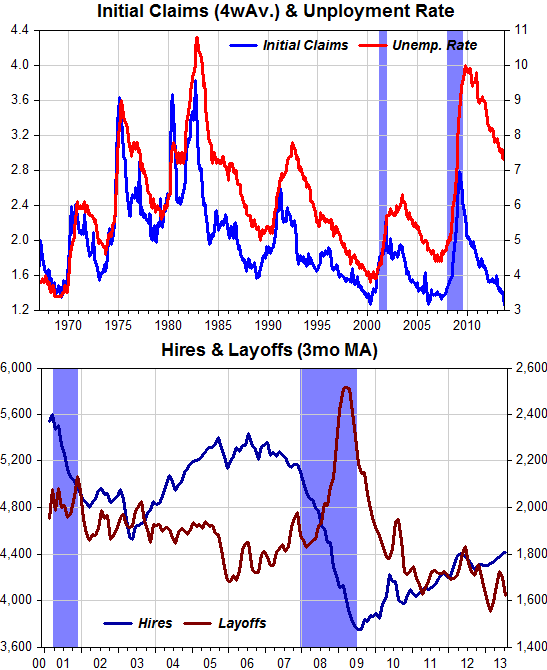 It is notable that layoffs are at record lows (data only begin in December 2000) and hires are ‘timid’. Further declines in the unemployment rate should hold, even though RGDP growth is low. 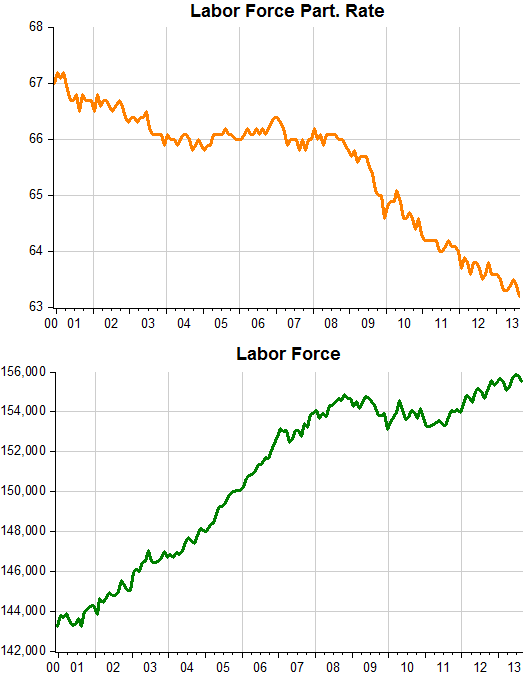 But that´s mostly due to the continuing drop in the LFPR and a slowly growing labor force. Of course, the key question is: How much of the current unemployment rate is really due to mismatch, as opposed to conditions that the Fed can readily ameliorate? The answer seems to be a lot. I mentioned that the relationship between unemployment and job openings was stable from December 2000 through June 2008. Were that stable relationship still in place today, and given the current job opening rate of 2.2 percent, we would have an unemployment rate of closer to 6.5 percent, not 9.5 percent. Most of the existing unemployment represents mismatch that is not readily amenable to monetary policy. The head of the Federal Reserve Bank of Minneapolis said Thursday the U.S. central bank needs to take a far more aggressive approach to lowering high levels of unemployment in a situation that has strong parallels with the radical action the Fed took to break the back of high inflation a generation ago. The official, Narayana Kocherlakota, stopped short of saying what actions theFederal Reserve should take to engineer a quick decline in the unemployment rate. But he did say that those who fear monetary policy action has little power left after half a decade of unprecedented actions are wrong. A COLLEAGUE emailed me a Reuters story noting that, according to polling, the vast majority of Americans have no idea what quantitative easing is. This is a result I find neither surprising nor discouraging; surely the public has better things to do than learn about QE. At any rate, the colleague shared the story as part of an ongoing discussion about just how central bank expectations-setting works. I dashed off some thoughts back to him in an email, and I thought I may as well share them with the internet. My sense is that what the Fed should do is target the trend path for a nominal variable that minimises the consumer experience “weak job market”. I think a nominal GDP level target accomplishes that. And once the Fed adopts that target the system will work as it does around any target. The Fed message will be intermediated by financial markets. Consumers will to some extent take their cues directly from financial markets and will to some extent take their cues from the reaction by sophisticated businesses to the reaction in financial markets. That’s not to say that the system never relies on direct communication from Fed to household. It’s different for regime change events like Rooseveltian reflation or Volcker disinflation, when someone is basically shouting “expect higher (or lower) prices!”. 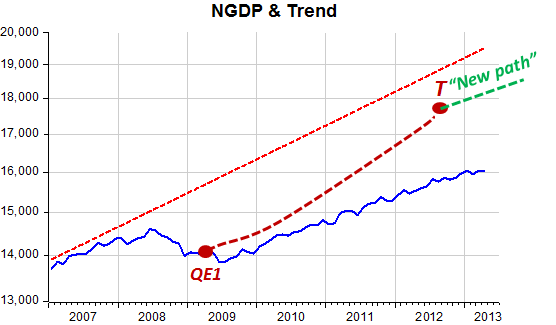 My sense of what the Fed should do at this moment is shout “expect faster growth” for the benefit of households, and announce a target switch to NGDPLT complemented by QE for the benefit of financial markets. 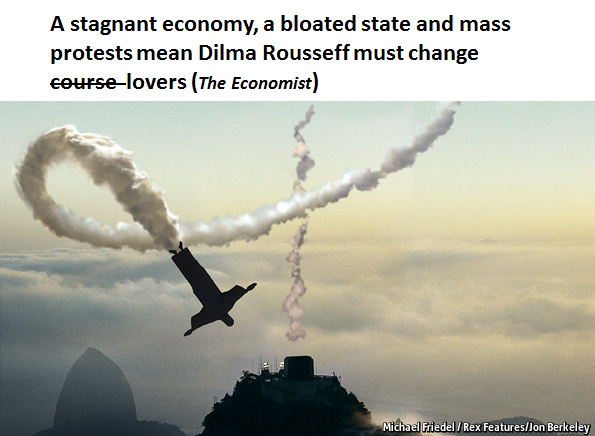 Update: They hope the Economist will get it wrong again! It should have been clear from the beginning that big trouble was ahead. Economic history is history and is never perfectly straightforward. Yet the clear lesson from the Great Depression was that aggressively expansionary monetary policy was both necessary and sufficient to end the decline and restore rapid growth. In 2008 most of the rich world was poorly positioned to heed that lesson. That was mostly the fault, or rather the pride, of a generation of inflation-fighting central bankers. Thanks in large part to the achievement of low and stable inflation, nominal interest rates edged slowly downwards from the late 1980s on. On the eve of the crisis the Fed’s preferred interest-rate tool—the federal funds rate—stood at just 2.0%, leaving the central bank almost no room to support the economy when financial disaster struck. Even so, inflation-obsessed central bankers were slow to react to the unfolding disaster thanks to distracting effect of high oil prices. As oil surged in early 2008 core inflation rose to 2.5% and headline inflation hit 5.6%. The Fed, which had begun lowering rates in late 2007 to buoy the economy amid a broad housing bust, paused in early 2008 despite continued deterioration in the economy. Remarkably, the Fed took no interest rate decision at a meeting on September 16—after the Lehman failure—because, “The downside risks to growth and the upside risks to inflation are both of significant concern to the Committee.” That despite the fact that the price of oil had already dropped $50 a barrel from July and month-on-month CPI inflation was negative in August and September. 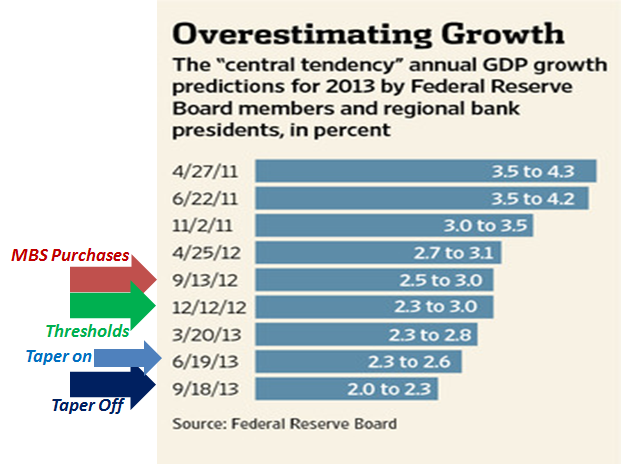 The Fed needed more certainty that economic weakness would weaken inflationary pressure before acting. It soon got it. Still the Fed remained woefully behind the curve. It acted quickly to prevent a freeze-up in money markets from paralysing the economy entirely. Yet it waited until December to bring rates all the way down to zero and until March of 2009 to properly start quantitative easing: a delay no doubt caused in part by uncertainty over how best to act once short-term rates are at zero. In the five years since the Fed has repeatedly dipped into its tool kit to prevent dangerous disinflation and to make sure the unemployment rate moves in the right direction, however slowly. But it has never found the nerve to do the one thing that might have generated a robust recovery. The Depression was not, fundamentally, about the failure to understand the importance of demand and the way an economy could become stuck operating well below potential. It was about the tyranny of a bad idea: the gold standard. Or more honestly, it was about the set of institutions, cultural norms, and men who gave the idea its power. There was an intellectual skeleton beneath the gold standard—and an era of prosperity on gold (the great period of globalisation from 1870 or so to 1914) to give the intellectual arguments teeth. Yet the extent of the devotion to the system, and the level of suffering governments were willing to impose on citizens on its behalf, goes well beyond the loyalty normally commanded by economic policy norms. Britain drove its economy into the muck in the 1920s trying to deflate enough to return to gold at the prewar parity. Governments suffering crippling levels of unemployment, bank runs, and social unrest squeezed their economies even harder with rising interest rates, simply to prevent a pile of gold in a vault from getting a bit smaller. In Germany the government of Chancellor Heinrich Brüning refused to expand the money supply even after effectively going off gold, in the process helping to bring the Weimar Republic to an end. Britain and Germany were forced off gold for lack of reserves. America had reserves galore but let gold orthodoxy squeeze its economy anyway—until Franklin Roosevelt ignored the concerns of his more sober-minded advisers. Even given the example of how effective reflation was at boosting the real economy the old ideas maintained their power. The choice to sterilise new gold inflows in 1937 to rein in inflation sank the American economy back into recession. Hard money was sensible, serious, responsible. Gold was what the sober men of the age knew to be the bedrock of sustainable economic expansion. And they were all horribly wrong. 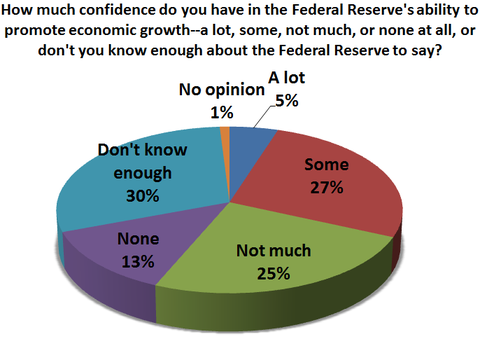 Only one in three Americans has confidence in the Federal Reserve’s ability to promote economic growth, while little more than a third think the Fed is spinning its wheels, according to a New York Times/CBS News poll. The remaining respondents said they did not know enough to answer. Most Americans, it would appear, remain either unaware or unpersuaded. Interestingly, Greenspan was dubbed “The Maestro” with the Fed being “The Soloist”. Bernanke, apparently, has downgraded the Fed to “third or fourth fiddle”! A formal discussion of NGDP Targeting has reached the Shadow Open Market Committee. Let´s hope it progresses to the ‘real McCoy’. It must be stated explicitly that the foregoing discussion does not point to any inconsistency on the part of Woodford. As he would perhaps emphasize, the discussion in Woodford (2013) is not concerned with policy rules of the type that is considered above in Section 3. Instead, in this more recent piece Woodford’s main concern is to devise communication strategies for informing the public about policy actions to be taken in the future. In particular, the relevant topic is “forward guidance,” defined as “explicit statements by a central bank about the outlook for future policy, in addition to its announcements about immediate policy actions that it is undertaking” (Woodford, 2013, p. 186). In this context it would be difficult to disagree with one of his positions, namely that “… the most effective form of forward guidance involves advance commitment to definite criteria for future policy decisions…,” rather than mere forecasts. This paper’s body of research is very impressive, intellectually. To me, however, its focus on forward guidance seems to distract one from a larger issue, namely, that the Federal Reserve has not been willing to conduct policy in accordance with any clearly defined policy rule (such as the Taylor Rule). A nominal GDP target for this rule, rather than the weighted average of inflation and output gaps as embodied in the Taylor rule, would represent a slight simplification that might add clarity and could be helpful in communication with the public. Within that context, the discussion in Section 3 above indicates that the growth-rate version would be preferable. More generally, an emphasis on the forward-guidance literature, with its subtle and indirect expectational effects, seems rather misguided. For many years, until the introduction of the Euro, the world’s most respected central bank was the Deutsche Bundesbank. This was true despite the fact that its rhetoric was rather inconsistent with its actions. Its policy was effective, nevertheless, because the public knew, from experience, that it was dedicated to keeping inflation under control, at a reasonably low rate. Buoyed by her overwhelming electoral victory, German Chancellor Angela Merkel has lost no time in asserting that she sees no reason for a change in German policy towards the European debt crisis. In that context, she has again touted the merits of fiscal austerity and structural economic reform as a cure-all for the ills of the European economic periphery. And she has again held up Ireland as the poster child for that approach. While Ireland has certainly been among Europe’s better students in terms of policy implementation, the economic results achieved to date from those efforts seem to have been rather paltry. Indeed, although Ireland’s export sector has been strengthened by improved competitiveness, its overall economy experienced a double dip recession in the latter part of 2012 and early 2013, before it managed to barely grow by 0.4% in the second quarter of the year. This still left Ireland’s GDP 1¼% below the level of the same period a year earlier. It also left Ireland’s unemployment rate at around 13½% of the labor force. Holding up Ireland as Europe’s poster child sits oddly with the IMF’s most recent assessment of the Irish economy. In the IMF’s view, Ireland faces an uncertain medium-term economic outlook, which still clouds the country’s economic prospects. The IMF believes that Ireland’s economic recovery very much hinges on growth strengthening significantly in Ireland‘s main trading partners and on continued favorable conditions in international financial markets. This is because domestically, demand recovery faces drag from still high private sector debts, continuing fiscal consolidation, and risks to the domestic credit flow necessary to sustain the recovery in the medium term. You don´t need many words to make clear that Ireland is at most a “poster victim” of the euro. One picture tells the story. 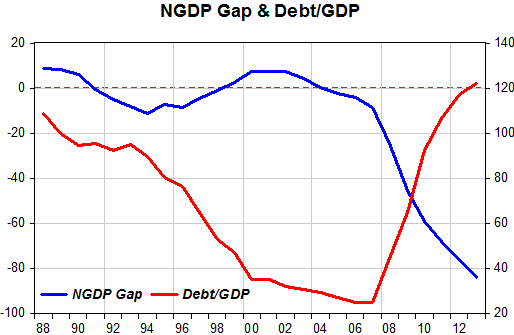 Although Ms Merkel touts the merits of fiscal austerity, what is clear is that the debt ratio ballooned from an extremely low level because nominal spending tanked! And the roots of that are clearly of a monetary nature. 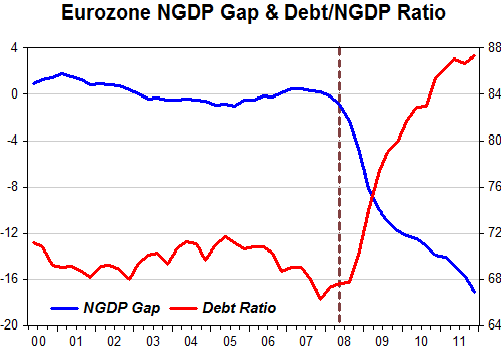 Ireland is a “poster victim” because differently from the collection of eurozone countries it´s debt ratio was trending down consistently. For my part, I have been wrong about everything. 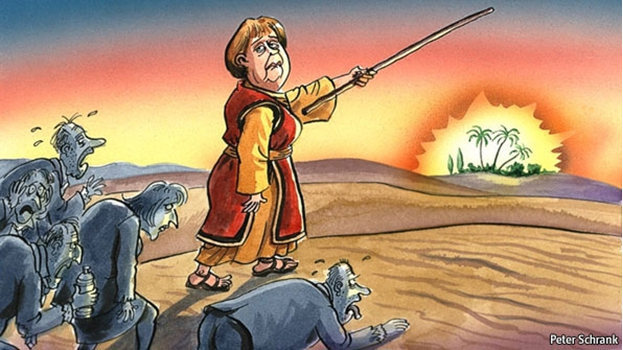 German discipline policies for the eurozone have been a tremendous success. I am ashamed for suggesting otherwise.